I have long ago thought abbout making a wall about Tsubasa,but my skill is still very poor...so ,try this time . Great Job! I really like the scan and the background is great too. I really like the trees and the mountain in the back! I looked at your past walls and this one is great! Adding to favs! The background is very beautiful with this scan. I like the tree which is changing colour on the right a lot. It's keeping the wall from being monotonous. Looks terrific. The scan is very nice, and the background fits pretty well. I like the out-of-focus effect on the mountains, personally, and those leaves are awesome... mad kudos on the leaves. My only nitpicky comment...well, I suppose I have two...is that the coloration and placement of the name/copyright info. The color is way too light, and the bluish purple color doesn't really fit the wallpaper very well. Also, it would probably be better shoved all the way over to one side or the other, not "floating" left of center. Choose a different color...I'd recommend black, but maybe a nice brown would work too...and anchor it to a corner and you're good to go. The second thing is that...well...the scan is kinda blurry in some spots and jagged in others. Only when you look close, though...otherwise it looks terrific. Still, it's a great wallpaper. Thanks for making it and uploading it for us to enjoy. very pretty! At first I mistakened it as a scan XD it looks great, the scan looks awesome. great stuff, i'm using this very one as my desktop pic...going in my fav! This is beyond awesome. They both look so great, especially Sakura, and blend into the background perfectly. Buen color! buena imagen! Esta preciosa! WOW! WOW! WOW! this is probably the BEST scan i've ever seen in my life! I love this pic of S&S you used for the wallpaper. The background kind of looks a little weird to me, but that's just me. 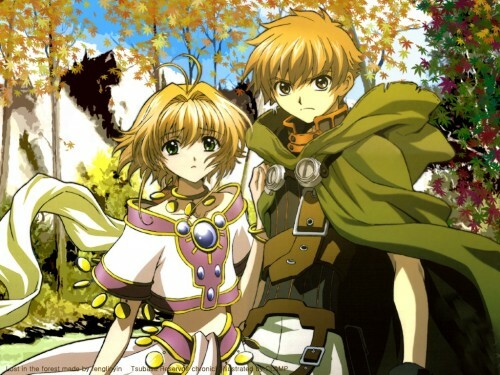 Great image of Sakura and Syaoran. Its nice how the background has the blurred affect. Keep it up! that is a wonderful image of Sakura and Syaoran together, and the background is lovely as well. I like how you've put it together.